Finish Choices: Antique brass, nickel or copper. Polished brass, nickel,copper or black nickel. Enamel color fill can be added , up to 4 colors on one side, up-charge $0.20 per unit, per color. Increase Thickness: Per each .05 mm increase, add 15% to medal price. Standard lead-time, 14-20 working days from artwork approval. Artwork: Adobe Illustrator vector art, Adobe Photoshop or high resolution pdf, jpg or png. We just need your main logos. 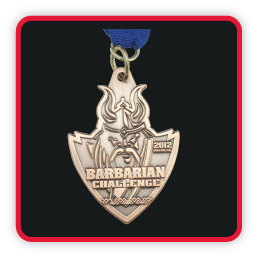 We can help you design your medal, first 1/2 hour of design time free!